A roughly polygonal univallate hillfort known as Alfred’s Castle situated c500m north west of Ashdown House. The earthwork defences consist of a single rampart bank which measures between 3m and 10m wide and stands up to 1.5m high. It was originally revetted with sarsen walls. Two seasons of excavations by Oxford University have revealed Late Bronze Age origins to the site with a Roman building within the centre of the enclosure dating from the 2nd – 4th centuries AD. Attached to the north of the enclosure is an elongated annex dated to the Late Bronze Age. The site has also been surveyed and mapped from aerial photographs. Beyond the rampart lies a ditch which is believed to have been built as a series of lengths with gaps between them. The ditch sections measure up to 1.5m deep below ground level, with the drop from the top of the rampart to the bottom of the ditch being at least 2.5m. The ditch varies greatly in width, but its average would have originally been c.10m. The area enclosed measures c.136m across and currently has three entrances situated on the north east, south east and north west corners. Only the south east entrance is certainly original and here is defended by further outworks consisting of a hollow way approach through a second rampart bank which survives as an upstanding, roughly triangular-shaped feature. Within the interior are a series of features which appear to represent stone building foundations. However, it is unclear whether those which are visible represent the original buildings or a later reuse of the site. Excluded from the monument is the boundary fence which crosses the ditch, although the ground beneath is included. Summary: Situated in a large natural ‘bowl’ overlooked by hills with the Ridgeway to the N, just to the west of Ashdown House (National Trust) consisting of an extant small enclosure, 1.2ha, and a ploughed-out large annex enclosure to the N, approximately 4.1ha. A long history of recognition from Aubrey (17th century) onwards, see Gosden and Lock (2013). The small enclosure is univallate with a good surviving rampart and ditch, approximately hexagonal, three breaks through the rampart at the NE (unknown date), SE (Romano-British) and NW (Iron Age). Geophysics (Payne et. al. 2006) and excavation (Gosden and Lock 2013) have shown occupation within the small enclosure concentrating within the 5th-3rd centuries BC (C14 and archaeo-magnetic dates and pottery), roundhouses, pits, material culture and environmental evidence, plus a Romano-British farmhouse dating to 1st-3rd centuries AD. 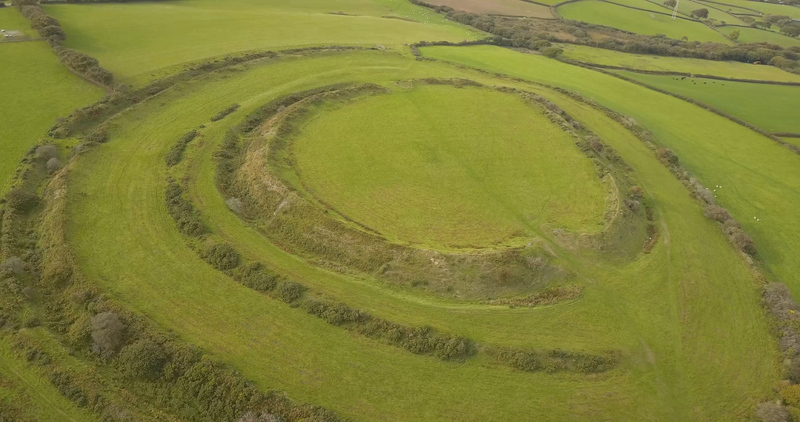 Pre-dating the hillfort are early Bronze Age round barrows and late Bronze Age linear ditches. The large enclosure seems to have been of a less substantial construction, perhaps an annex for livestock.